Why would I use Magento instead of Shopify? What’s the difference? I’m shopping for a new e-commerce cart system and there are so many things to consider. I’m looking at Shopify and Magento mainly and I know there are quite a few more. What are the differences between these two for starters? How do I know which e-commerce shopping cart solution is right for me? This is a common question we get with new and experience e-commerce merchants. They have some similarities but ultimately are very different products. First off Shopify is much less involved and much less of a commitment to set up for beginners, period. It’s also great for niche industries that don’t have a lot of competition or need a lot of serious customization. Shopify has a ton of options for plug-ins much like Magento. The big difference there is the Shopify plugins are much more rigid and don’t allow customization compared to Magento. 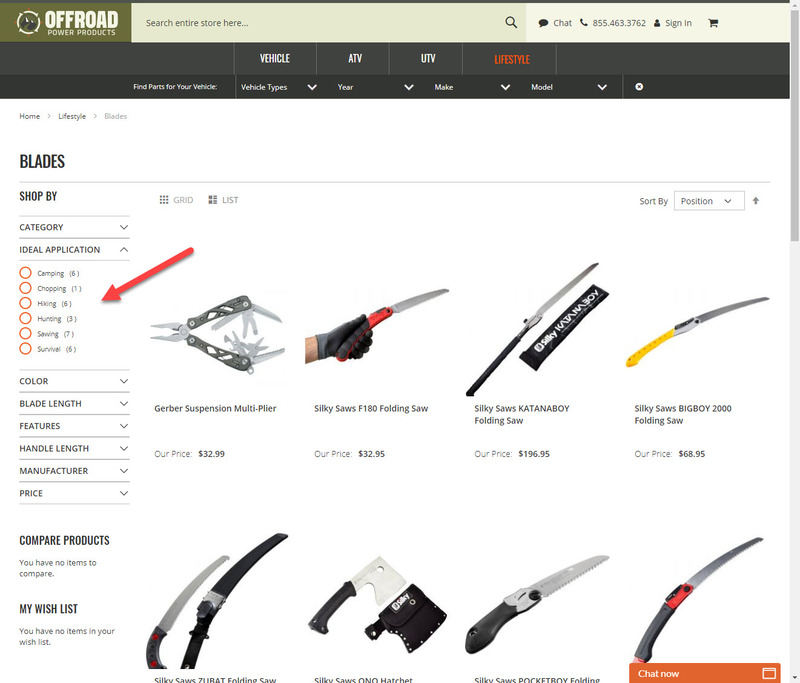 My hands-down biggest difference with Shopify and Magento is the catalog structure. Say you’re an auto parts retailer with 10,000 products, you’ll want to make it really easy for customers to find their part. Magento uses something called Layered Navigation (Faceted Navigation) which is basically a customizable filtering system that allows customers to shop based on attributes. This is a terrific way to have a finite way for customers to find a product fast based on whatever bits and pieces of what they know about the product they are looking for. For example color, application, material, pattern, style…are all common attributes you can set up for customers to use and shop by. Well, Shopify can do that right? Well…Shopify is great in many ways and yes you can “fake it” but it doesn’t have the powerful Layered Navigation that Magento has. Shopify uses tags to attempt to reproduce this same shopping experience and I’ve not seen any Shopify sites that have usable layered nav suitable for large catalogs. That said, Shopify uses something called Collections that uses simple rules to associate products which is great so you don’t necessarily have to add products to categories manually. 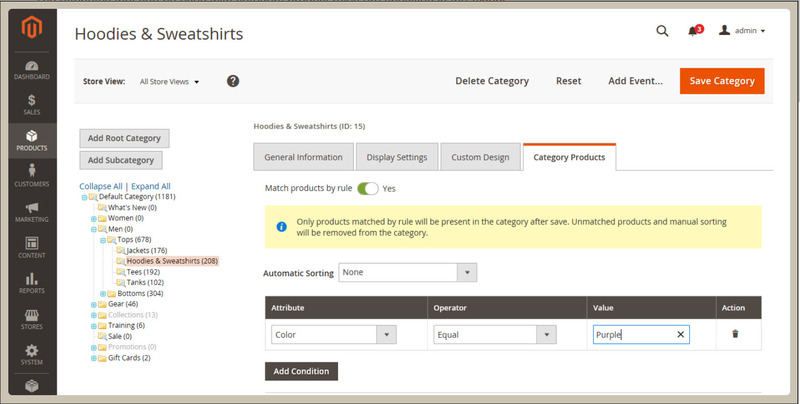 Magento 2 Enterprise has a similar feature as well that allows products to be automatically placed into categories based on more advanced rules. Magento 2 Enterprise (Commerce Edition) allows you to also merchandise your products via drag and drop and other advanced rules. 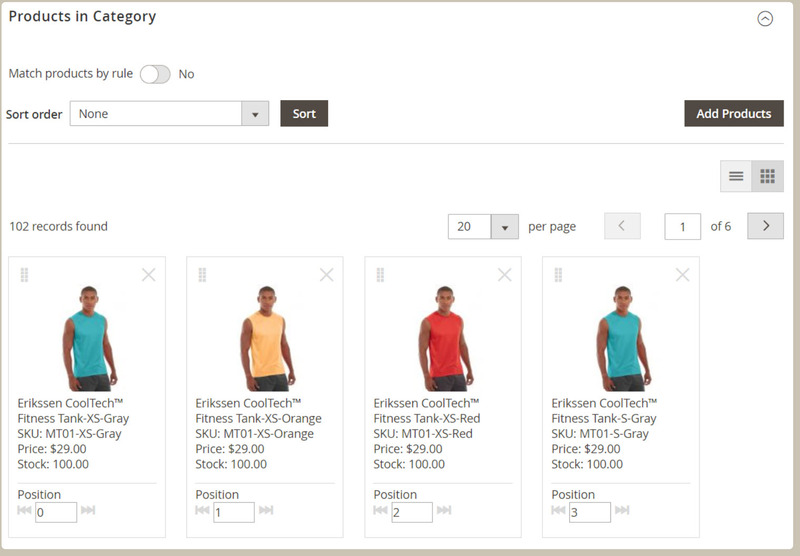 Magento 2 Enterprise (Commerce Edition not Community Edition) allows you to also merchandise your products via drag and drop and other advanced rules (above). The other huge factor is how much in-houseÂ IT resources you have. Shopify is hosted for you and you pay a monthly fee and they handle most of the support for you (which is limited but they’ll keep your site up at least). Magento, even the Commerce version is hosted by…you. That means you have to pay a 3rd party Magento host to maintain your Magento website. That’s good and bad but it’s always more expensive than Shopify and takes more resources to maintain…but you’re getting a completely customizable infrastructure with Magento…it’s a trade-off. If you don’t have a solid IT staff available and don’t need a custom shopping experience advantage over your competitors you might be able to get away with Shopify and some plugins. A lot of people do it and make great money. As you know, my personal expertise is with Magento and that’s my tool of choice (budget permitting). There’s so much to this topic! Please reach out anytime for more information on this.